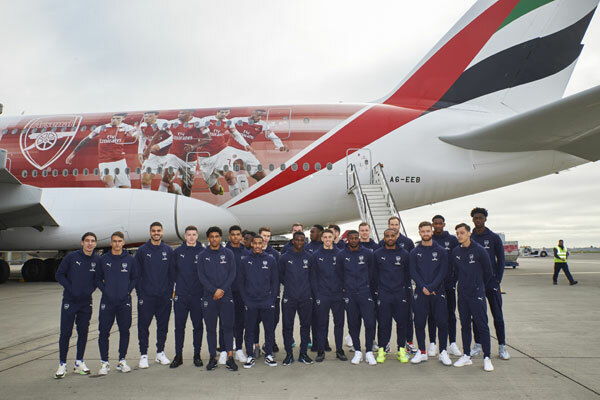 Arsenal Football Club today boarded a newly branded Emirates A380 with a livery featuring a montage of Arsenal first team players. The club is making their way to Dubai for a friendly match with Al Nasr Sports Club as well as the official inauguration of Al Maktoum Stadium, taking place on March 26. This is the first time in Emirates’ history that the whole Arsenal squad visits their Dubai home, and the airline will be supporting the visit by connecting fans in the UAE with one of the greatest football clubs in the world. The bespoke decal showcases the Arsenal Crest and features Lucas Torreira, Mesut Ozil, Pierre-Emerick Aubameyang, Henrikh Mkhitaryan and Alexandre Lacazette. The decal covers a sizable area of 383-sq-m around the aircraft, with the images of the players identifiable from both the ground and in the air. Arsenal fans, as well as plane spotters, can catch the A380 under tail number, A6-EEB, as it travels around the world with scheduled services planned to Paris, London Heathrow, Amsterdam, Bangkok and Hong Kong.